The fourth edition of Beirut Design Week kicked off on June 1st and for the first time it was organized under a theme. With a focus on “Social Beings,” the week was split with events focused in different parts of Beirut on different days. The week of design began at the Souks and Saifi Village, while subsequent days were centered in Gemmayze, Achrafieh, and Mar Mikhael among other locations. This year’s event was the largest yet, with over 140 local participants, as well as designers from countries all around the world. In our exploration of this year’s week of design, we were pleased to see fresh work from familiar faces and Cities’ favorites, and we found many new designers as well. We would like to share a few of our experiences from this amazing week of design, and if you weren’t able to make it, be sure to visit Cities where a number of creations from these innovative talents are already on display. event director, Doreen Toutikian, this year’s design week was “underpinned by three principles: value over aesthetics, inclusiveness over elitism and dialogue over dictation.” As she stated, “We believe in the value of design, which is far more than just aesthetics.” This attitude is one of the things that make Beirut Design Week such an enjoyable experience; its goal isn’t just to share new ideas, but to encourage and instruct as well. This year’s edition of Beirut Design Week started in celebratory fashion with numerous opening parties and special events. 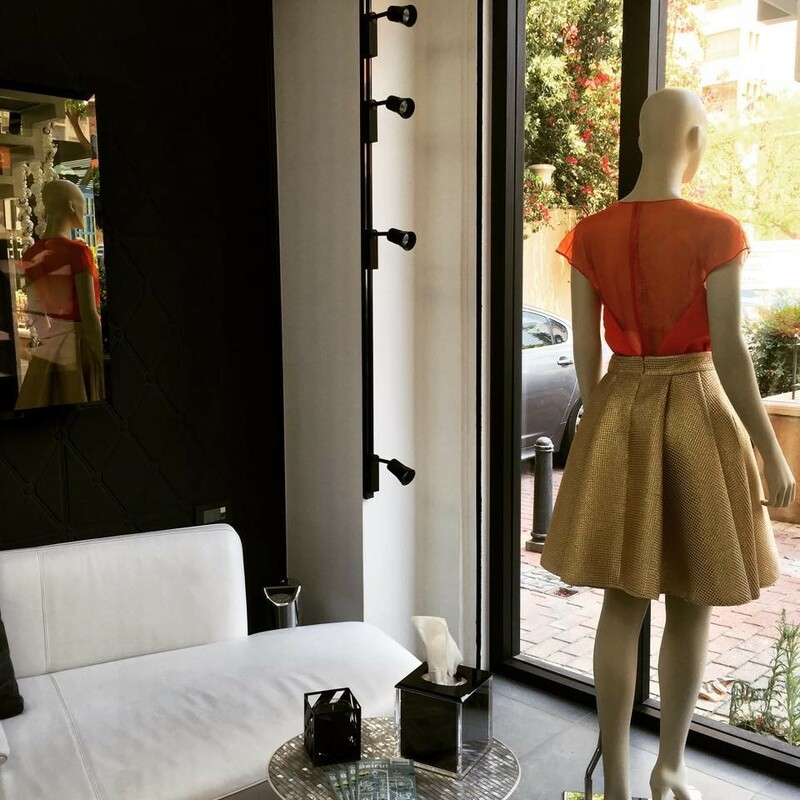 Among the highlights was a visit to the Dina Jsr boutique in Saifi Village which featured a sale on her SS’15 collection in honor of Beirut Design Week. The opening party at Bokja, called Bokja’s Going Commando was another fun affair as five classic furniture pieces were presented without their characteristic multi-colored coverings to allow guests to re-imagine a Bokja piece. Nada Debs was also in a festive mood as she celebrated her studio’s ten year anniversary with the presentation of “CraftCool II: Out Is In” which featured live straw-weaving and new outdoor furniture. In addition, AIGA Middle East hosted a design competition called “Karasi: Bringing Design to the Table” as part of their centennial celebration. 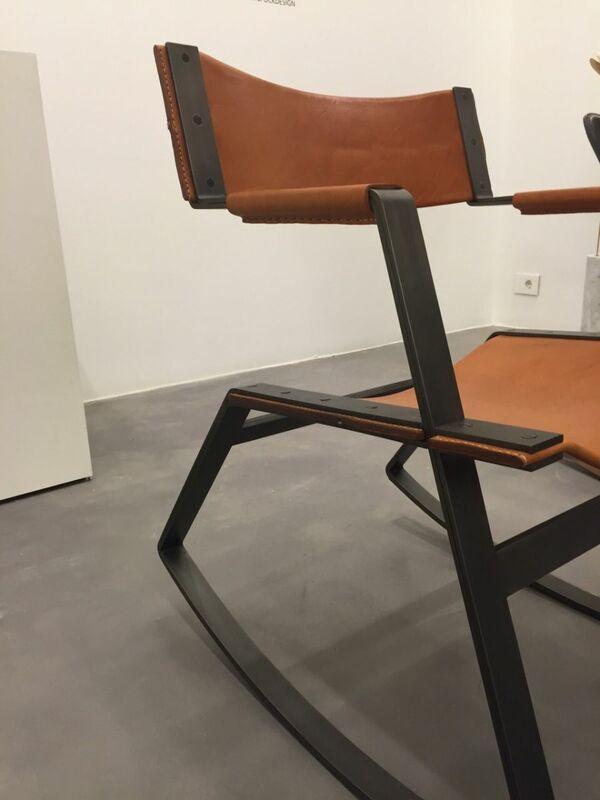 Twenty Lebanese designers and studios were tasked with creatively readapting chairs donated by B Design. 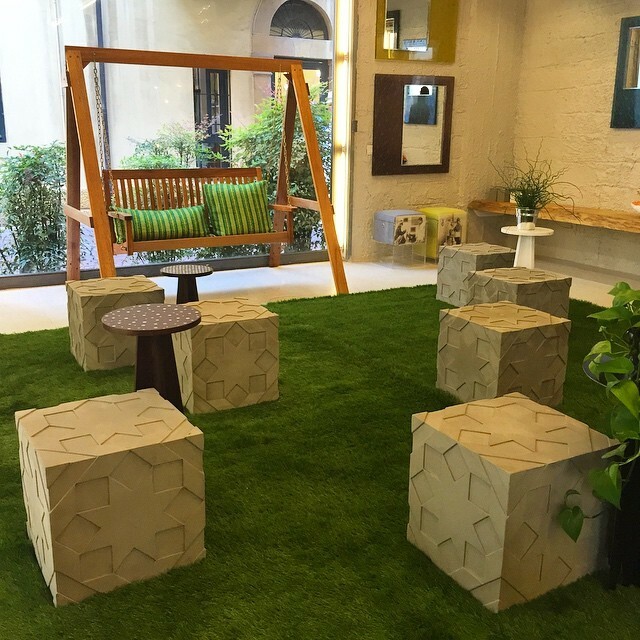 The resulting creations were shared in an exhibition by AIGA during Beirut Design Week. 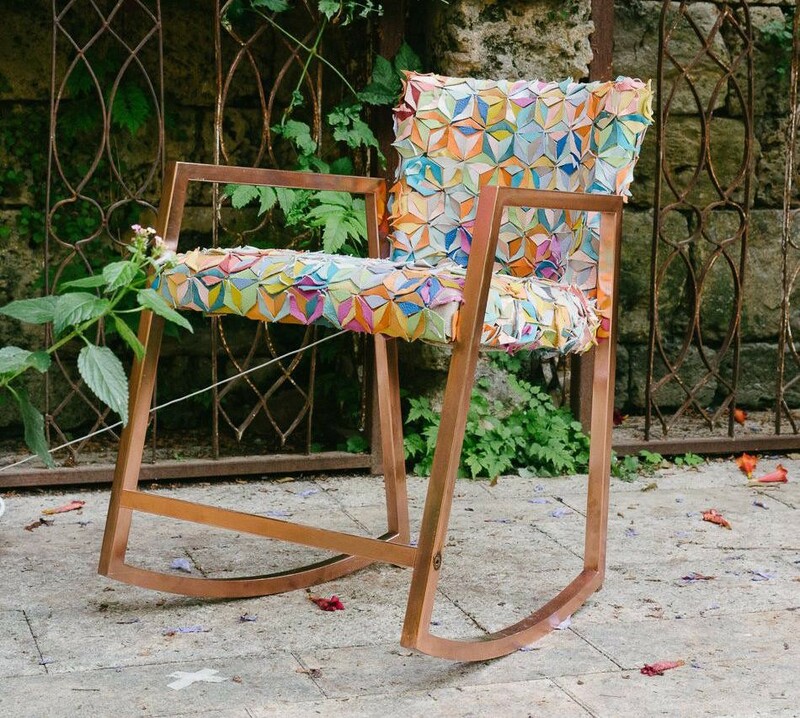 The winning chair came courtesy of Arine and Stephanie Atamian who fashioned a rocking chair inspired by arabesque and origami patterns. Called Noshi, it was covered with geometrically shaped pieces of colored leather which resulted in an intricate and unique creation with a modern feel. 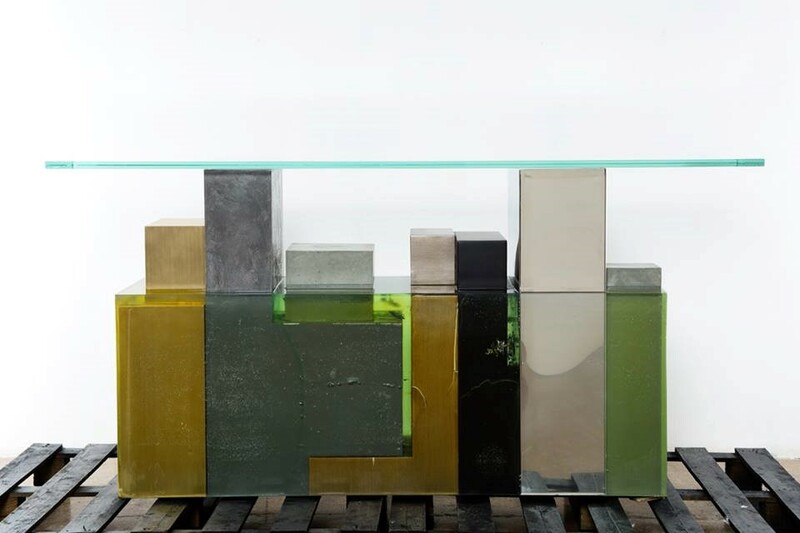 During our experience at this year’s event, we were pleased to see new work from several designers we support at Cities including design group Hawini. 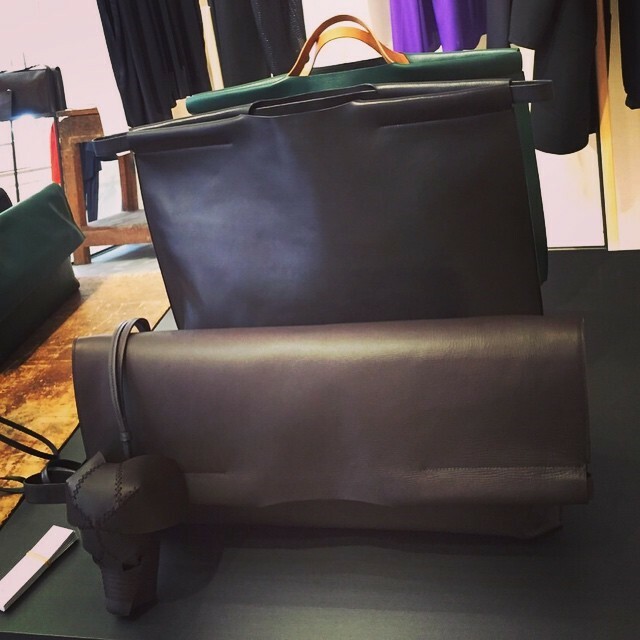 In contrast to their Pop Art creations currently on display at Cities, Hawini fashioned a selection of leather bags for Maison Rabih Kayrouz as part of their contribution to Beirut Design Week. The bags were celebrated at their launch “an?thro?po?mor?pho?sis” which took place at Maison Rabih Kayrouz. Cities is well aware of the talents Hawini possess in working with leather as our staff carried their own Hawini bags made especially for Cities during our display at the recent Design Days Dubai. 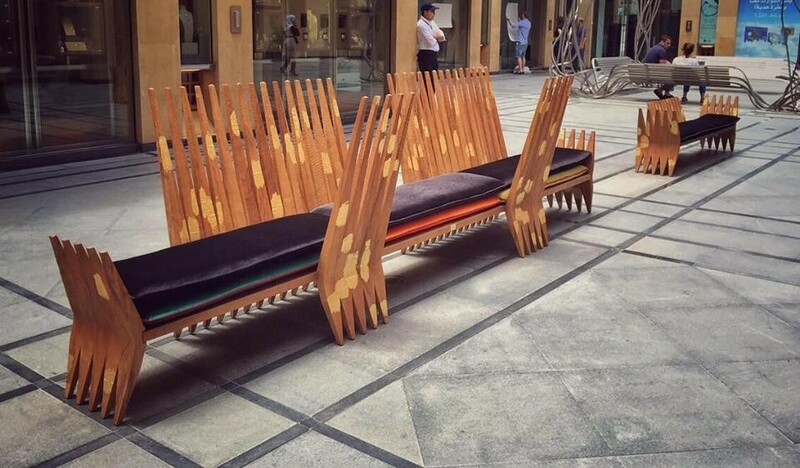 We also enjoyed seeing the newest piece from Khaled El Mays, as his Hide and Seek bench could be found in the Souks and provided seating for numerous visitors. The Hide and Seek bench is part of the Audience Set from his Circus Series and can also be utilized as a bar for serving. 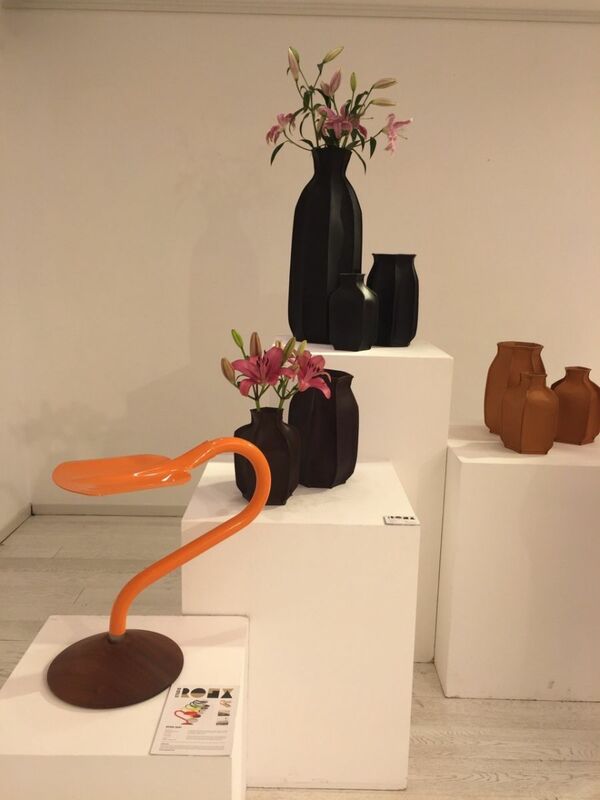 The latest designs from Khaled El Mays proved to be very popular as he also took part in the Station Beirut Design Market and had works on display in the Based in Beirut exhibition which featured pieces by a selection of Lebanese designers as well. In addition to the work of Khaled El Mays, we discovered several other intriguing designers at the Based in Beirut exhibition. 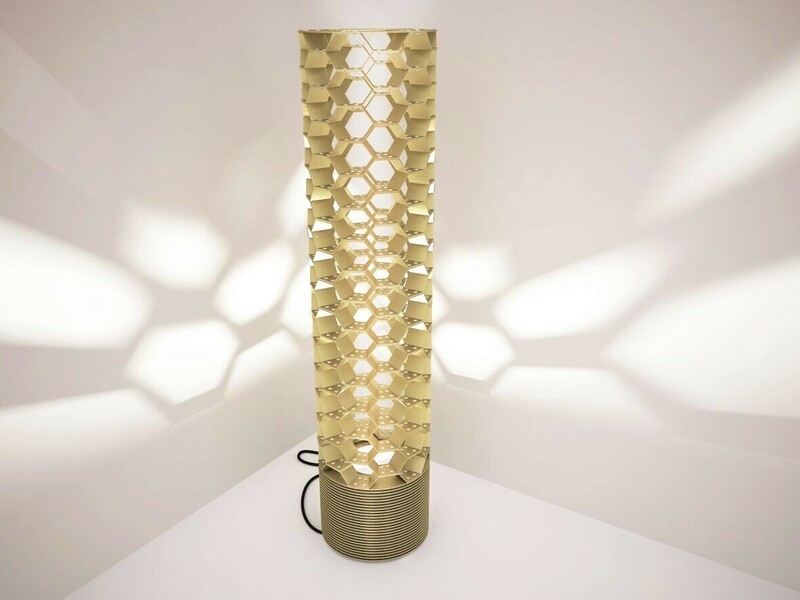 Our favorite by far was the work of product designer Charles Nakhle who shared pieces from his Honey collection which is based on a honeycomb structure and made out of a single modular steel element, connected using rivets. Within the collection, he has created stools, tables, mirrors and lighting, each utilizing the geometric honeycomb pattern. In addition, he has created the Reverence stool and table which take inspiration from a person in the act of a bow or curtsey. 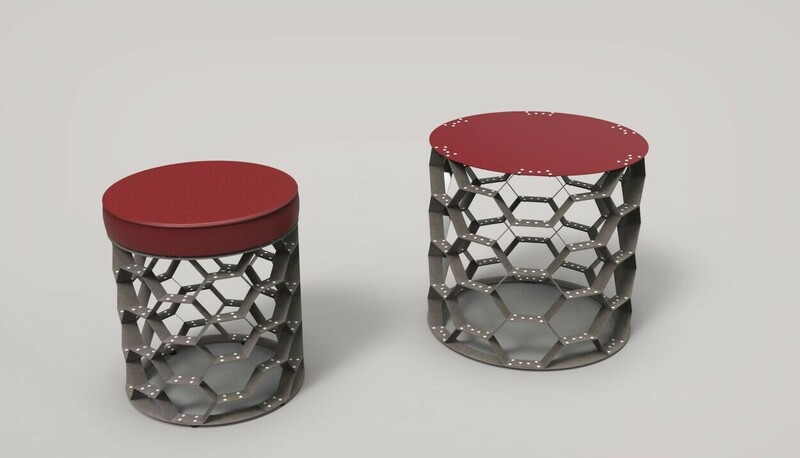 The stool and table are composed of symmetrical sections of Avodire wood and the top of each is hexagon-shaped. The pieces offer a study of grace and balance created using geometrical components which impart strength and stability and these contrasting elements join together in Nakhle’s work to stunning effect. 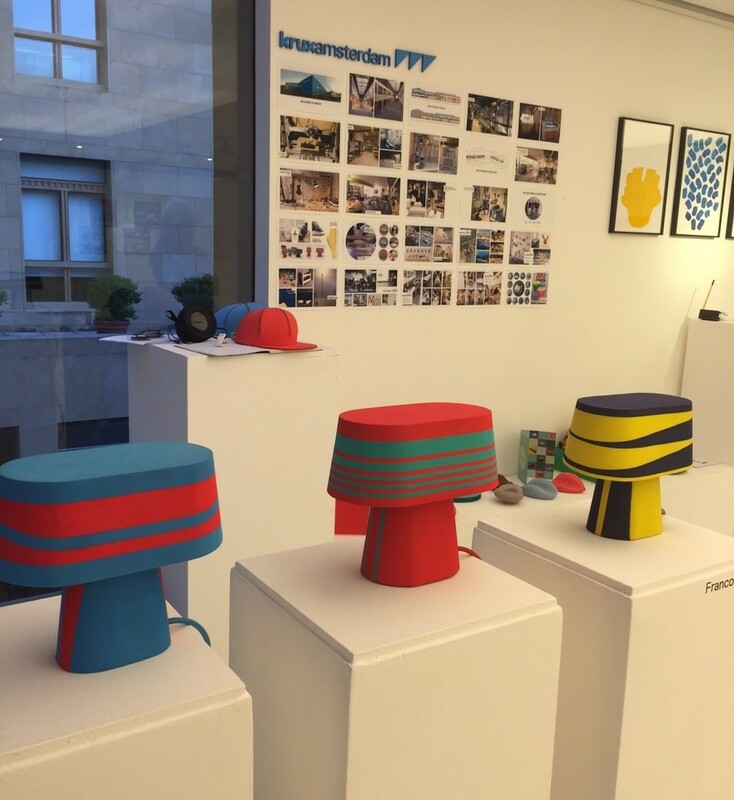 We also enjoyed the Dutch and Finnish design exhibitions which were open to the public all week long. 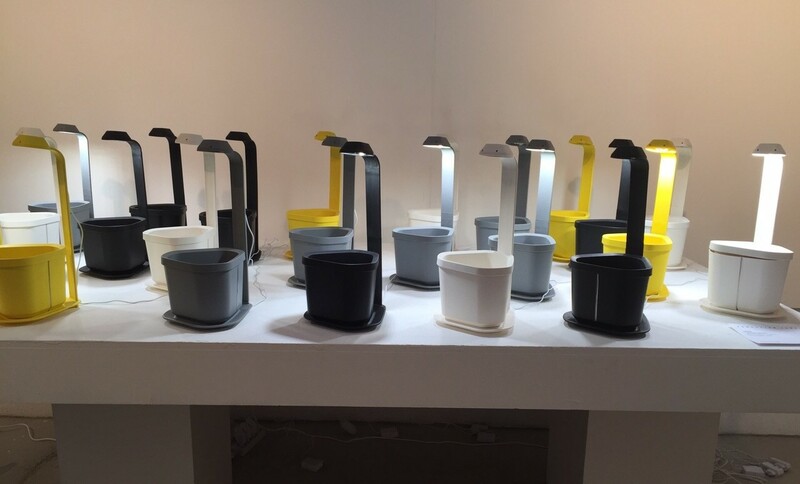 Dutch Designers which made a big impression included Studio Roex who introduced their Plumber’s Piece vases which are made of leather and rubber and were inspired by the shapes of the rubber membranes found in expansion tanks. They are also the creators of the Spade Seat which is made of stainless steel with a concrete or mahogany base and was conceived to encourage observation of familiar forms and shapes in different contexts. The Meshmatics Chandelier by Atelier Rick Tegelaar also gained notice for its use of unusual materials. Composed of an LED light source and layers of mesh chicken wire, the lamp “casts an elaborate web of shadows” as a result of its composition. 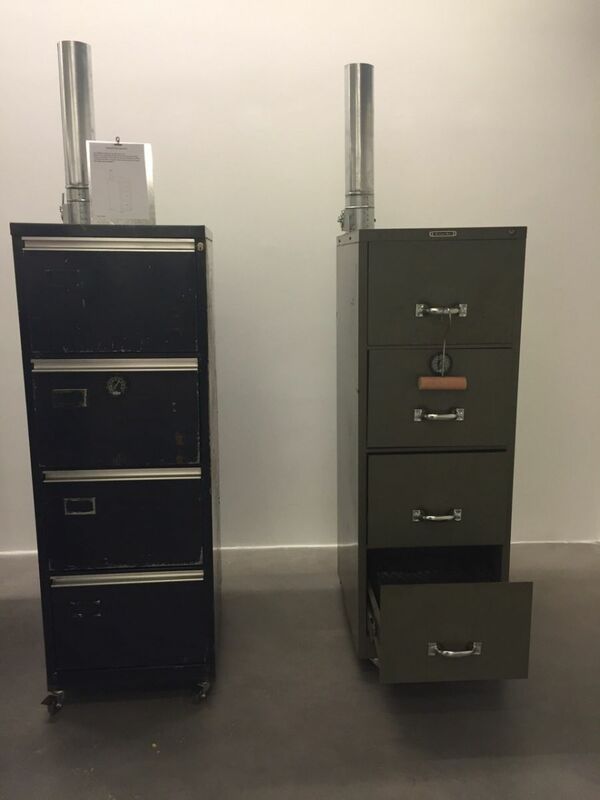 Other noteworthy pieces came from Atelier Max Lipsey who shared works from his Acciaio and Stage 2 Collections. 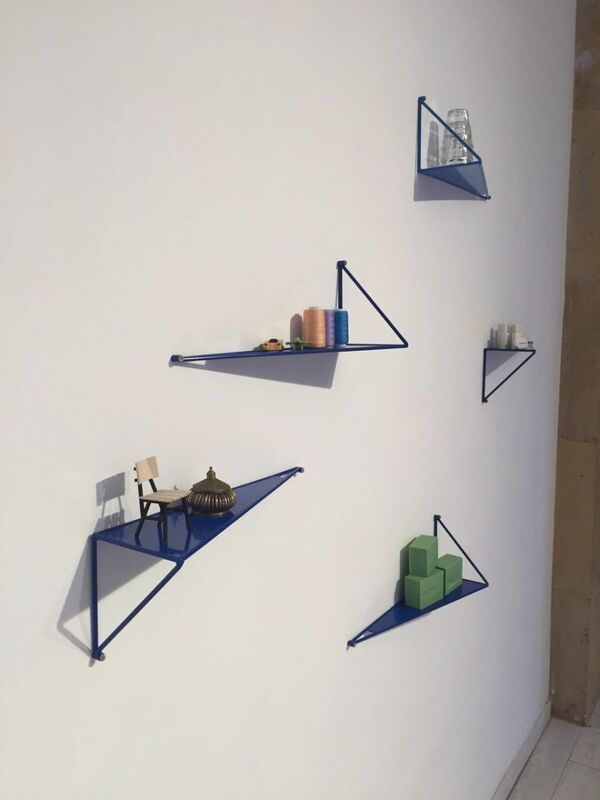 Both collections took inspiration from the geometric angles and materials of the classic racing bicycle and the resulting wall shelves, shelving units and tables are all functional in focus with an angular, modern appearance. In comparison, pieces at the Finnish exhibition also featured modern shapes and materials. 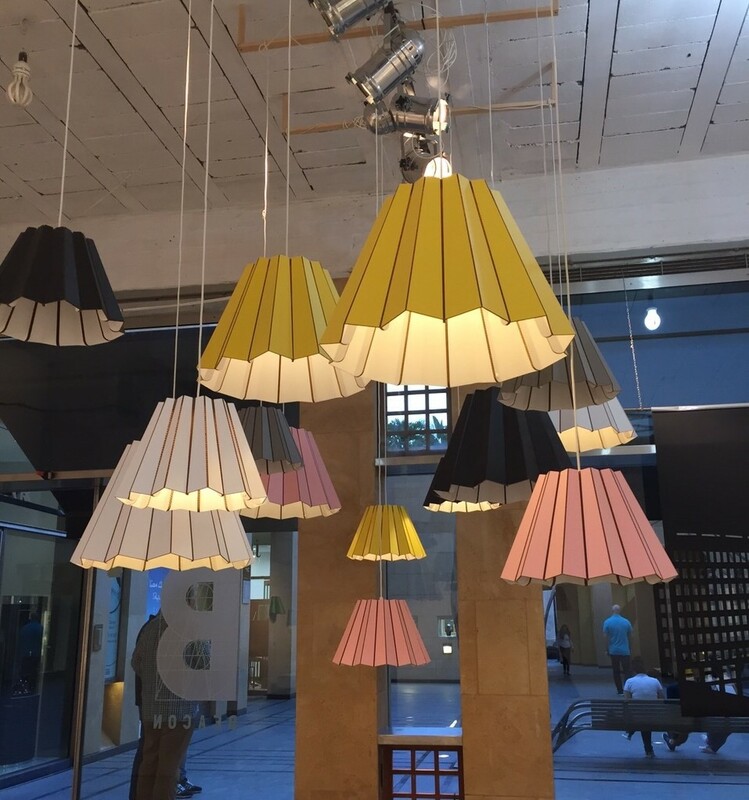 Works by Sebastian Jansson were quite popular, especially his Folded Pendant Lamp which relies on the same principle of folded paper bags. Handcrafted and made of a thin sheet of steel, the lamp can be bent at different angles to alter the atmosphere and ambience that it creates. His Genie Kitchen Garden also garnered attention. Created for Tregren and awarded the 2014 Good Design Award by the Chicago Athenaeum Museum of Architecture and Design, the Genie is suitable for a wide variety of plants. Thanks to its ample growing space and steady light source, one can grow plants, flowers or vegetables in even the smallest of spaces. Other noteworthy events included the unveiling of Sandra Macaron’s latest work, DD, a multifunctional sculpture dedicated to her grandfather in memory of the Armenian genocide. Macaron created the piece as a metaphorical representation of those individuals who were ripped from their homes and families. 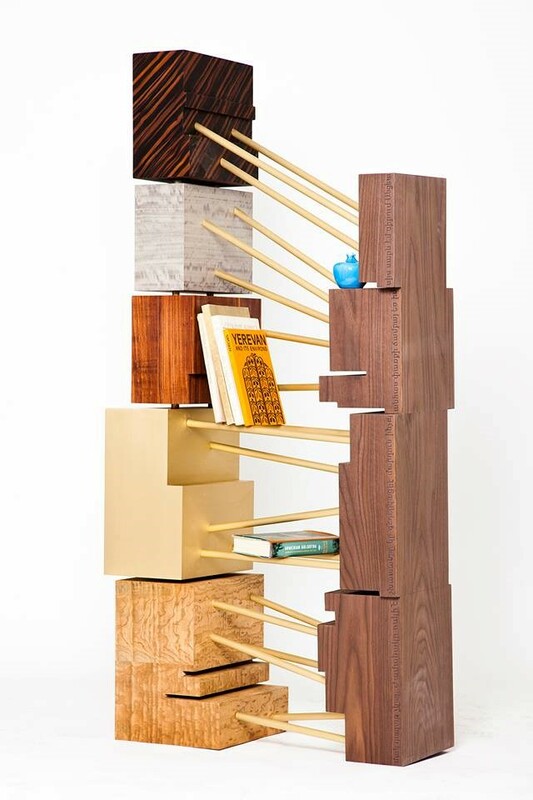 Made of wood with five different finishes to correspond to the continents and a copper structure to symbolize roots fighting to remain in place, the piece can be placed in different positions to transform it from a sculpture to a console or bookshelf. As such, Macaron has created a design which shares a personal story and also allows each user to adapt it to his own needs and perspectives. We also greatly enjoyed the Light My Fire collection launch by Karim Chaya at Art Factum Gallery. Created for his own Spock Design, this latest collection focused on the art of barbeque and grilling as he presented pieces such as the Squeeze Me Macaroni smoker constructed from a filing cabinet, and the Twiggy Twiggy hibachi along with a selection of tongs and other grilling accessories. 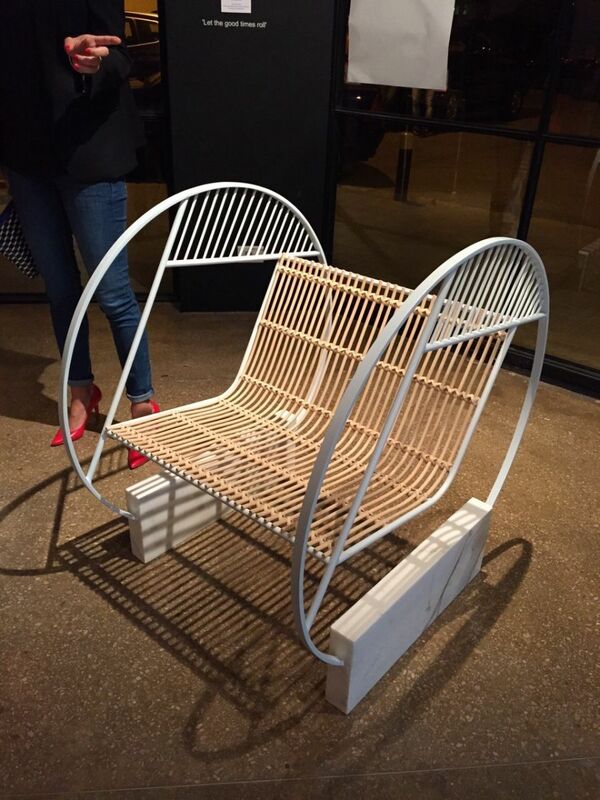 In addition, he presented a selection of items that will be on display at the upcoming Design Miami Basel 2015 including the Ferdinand and Arlette rocking chairs. 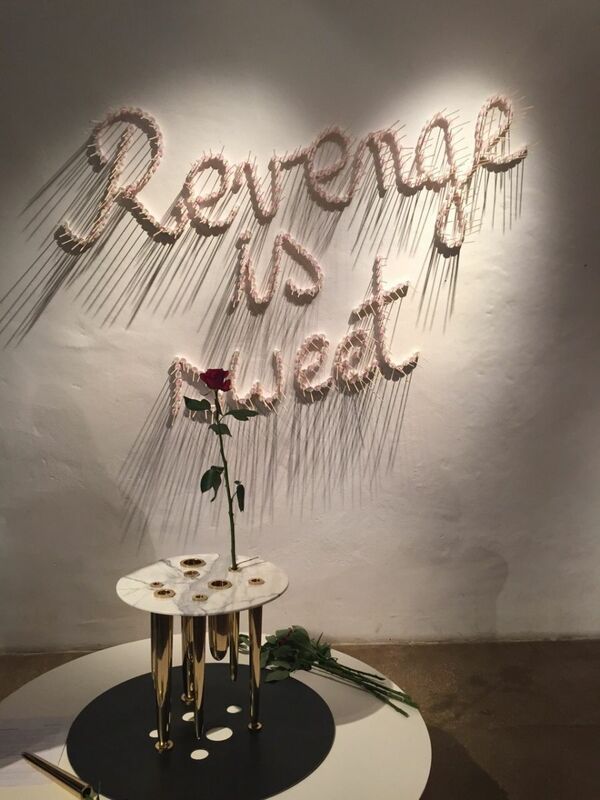 Finally, we stopped by the Revenge collective exhibition at SMOGallery. The exhibit featured a selection of diverse pieces all centered around artistic interpretations of the theme of revenge. Among the pieces on display were the Picard table by Hania Rayess and the Glory Holes table from Richard Yasmine. We also enjoyed the Rolling Chair by Fadi Mansour and the latest offering by Georges Amatoury, who shared his console, entitled Green Pompeii. Amatoury created the piece as a statement on man’s destruction of the environment, and Green Pompeii represents nature’s revenge upon mankind for all of the damage we have done. Despite the serious statement embodied by the piece, it was still representative of Amatoury’s sleek, modern style, and the result was a beautiful and thought-provoking creation. Although we’ve only shared a portion of what was on offer during this year’s edition of Beirut Design Week, there was so much more available. Our visits to the different events filled us with awe and inspiration, thanks to the wonderful design we encountered. Although we discovered a number of new designers, we were proud to see so many designers that are shared at Cities continuing to grow and create. We saw, learned, and experienced a lifetime of design in a few short days, and we can’t wait for the next edition of Beirut Design Week!